California Association of 4 Wheel Drive Clubs and Land Use & Access Advocate, for compiling this information. The recreation permit process as currently implemented on Bureau of Land Management (BLM) and U.S. Forest Service (FS) managed lands is overly bureaucratic, expensive for both agencies and the public, and often applied in an unfair and arbitrary manner. Efforts to encourage the agencies to modify and streamline the process have failed, even when those efforts were supported by agency policy. The current SRP process no longer serves the public interest or supports the goals and objectives of land use planning. The recreation permit process must be revised. Historic and regularly permitted events held by non-commercial clubs or organizations that occur on roads, trails and areas designated for public use should be approved based on prior or expedited analysis, so that little or no new analysis is required for the permit process. Nonprofit clubs should be recognized as distinctly different from commercial operations, outfitter and guide businesses, ski areas, and other private for-profit enterprises. Recognizing that increased level of partnering with public lands users will become necessary as budgets tighten, there is a need to leverage the resources available from clubs and organizations that hold events on National Forests and Public Lands. Competitive event SRP applicants should be credited for work performed, such as trail maintenance, and the credit applied towards any “cost recovery” fees. Currently, cost recovery is not required if the permit can be authorized with no more than 50 hours of staff time. 49 hours is free, but 51 hours is billed at 51 hours. The first 50 hours should be free, regardless of the total number of hours. To which activities does this increase apply? The Special Recreation Permit Fees do not affect members of the general public who wish to visit their public lands. Such casual users will continue to be able to use the public lands for recreation free of charge. The BLM issues Special Recreation Permits only for labor intensive activities and events conducted in BLM areas where irreversible and/or substantial resource damage could occur or there is concern for public health and safety. The fees therefore apply to competitive activities and events, such as endurance races, off-highway vehicle races, dog sled races, land sailing competition, and Eco-Challenge. Special Recreation Permits may also apply to organized group activities or events, such as the Burning Man, mountain man rendezvous, amateur rocket and hot air balloon events, and/or large social gatherings of reunions, religious groups, or large youth encampments, such as Boy and Girl Scouts, and the Campfire Girl. Over the years, even the most well meaning recreational users have attempted to comply with the regulations and run up against a process that is arbitrary, overly bureaucratic and costly. Recreation permits are supposed to be a tool for managing recreation use; reducing user conflicts; protecting natural and cultural resources; informing users; gathering use information; and obtaining a fair return for commercial and certain other uses of public land. The permitting process has become so complicated and costly that most “nonprofit club events” simply cannot comply with the requirements. In addition, historic and popular competitive events that have been occurring without problems have recently been subjected to arbitrary fees. In some areas, the application process to obtain an SRP is being used to prohibit and/or severely restrict otherwise allowable activities. Even where internal solutions are proposed by regulation or individual units, they have been challenged or applied inconsistently. A legislative solution is needed. Current recreation permitting regulations give wide discretion to the agency insofar as how each state or district office implements the permitting process. National regulations establish general “triggers” regarding when permits are required. However, just because you “trip” one of the requirements doesn’t necessarily mean you need a permit. Regulations allow land mangers to approve club rides via a Letter of Agreement. Sadly, few such agreements exist, and some managers require permits for some activities that “trip” one of these requirements, but not for all. This results in arbitrary application of the permit process. For lands managed by the Bureau of Land Management: if you have 50 vehicles, mountain bikes or “heartbeats” (e.g. 50 hikers or 25 equestrians) your activity is supposed to require a permit. (FS allows 75 vehicles/horses/hikers etc). But some states, field offices and local district offices have lowered the number. For example, BLM in Utah now requires a permit for groups as small as 25. As a result, public lands visitors must contact each individual field office or ranger district to find out if their activity requires a permit. If the event is “advertised” to the general public, that would trigger the permit requirement no matter how many vehicles or “heartbeats” actually attend the event. Some offices require a permit if the advertisement is simply in a club newsletter or on a club website, even if such is intended to simply notify club members of the event. This has resulted in land managers requiring a permit for “club rides” of as few as two vehicles. If you charge a fee, you must apply for a permit even if the fee is only to cover costs associated with the event or the fees are going to be donated to a charity. National regulations require permits for all commercial and competitive use, and one of the defining factors for both competitive and commercial use is whether any fee is charged. Sadly, the land managers make no distinction between charity fundraisers and commercial operations. Any and all fundraising activity is considered commercial and must be under permit. If your event is competitive in nature, you’ll definitely need a permit. As we mentioned above, just because you’ve ‘tripped’ one of those rules of thumb, it doesn’t necessarily mean you’ll need a permit. But if you do, this is a brief description of what the permitting process will entail..
At minimum, 180 days in advance of your event, a club will need to at least fill out an application and pay the minimum permit fee and/or a permit processing fee (if such a processing fee is set by the District Office). National regulations have set a minimum permit fee of $90. This minimum fee is applied to use fees, which means that if the total use fees for an event were $50, you would still pay $90.00 total; if the use fees were $100, you would pay the minimum fee of $90 plus $10.00, not $90 plus $100.00. In addition to your permit, you must also include a detailed “operating plan” for your event. Some local offices require maps and other information as well. Insurance and other stipulations are usually required. The agency is supposed to respond to your permit application within 30 days, but doesn’t have to let you know if a permit will be granted until 30 days before the event. Each District Office does SRPs differently, so it is necessary to contact the local Outdoor Recreation Specialist. All too often, the agency requests additional information, usually only days before the event is to be held. Thus, those groups that do attempt to comply with the permitting rules often find themselves scrambling at the last minute to comply with additional requirements. If the agency conducts over 50 hours of work to process a permit, there exists a mechanism by which to “recover” the costs1 associated with the event. Cost recovery is a HUGE issue and can make the cost of obtaining a permit astronomical. Many units attempt to use cost recovery as a tool to make up for budget, staff or performance shortfalls and/or as a way to avoid issuing a formal denial of the application. The Pennsylvania Snowseekers applied for a permit for their annual poker run to benefit the Susan G. Komen Breast Cancer Foundation. The application was completed correctly, received by the FS within the required deadline, and the event consisted of only 66 participants. The FS did not respond to the Snowseekers with a denial or an approval. Perhaps mistakenly, the Snowseekers interpreted the lack of response as tacit approval, held the event and raised over $1700.00 for Breast Cancer. A full week after the successful event, the FS sent the Snowseekers a denial! Two members of the Snowseekers were subsequently ticketed by the FS. At the hearing in Erie Federal Court, the judge had no choice but to find the Snowseekers in violation of FS regulations and imposed a small fine ($25.00). While ruling, however, the judge admonished the FS for not processing the permit in a timely manner and not finding a way to address concerns regarding this event outside the federal courtroom. 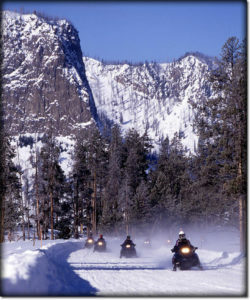 Every February, the Skyline Sno-Riders Club from Fairview, Utah, held a charity fundraiser on private property. This year, Skyline’s President received a phone call from the local Forest Service office inquiring about the size of the group and concerned that a permit might be required. 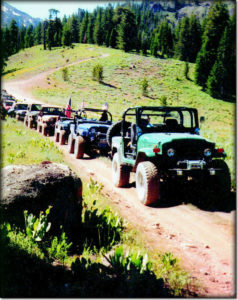 Even though any activity was separate from the charity ride, and no fee for activity on Forest Service lands was being charged, the FS was concerned that the charity event might ‘spill over’ on to FS lands. The FS stated that any group over 75 would require a permit. Seeking to maintain good relations with the FS, the Utah Snowmobile Association stepped in and began the permit process. However, when USA sought insurance from the list of approved Forest Service carriers, none of them offered a policy that complied with the FS’s requirements, thus, USA was unable to legally obtain a permit. Even though the whole situation cast a pall over a successful fundraiser that has been going on for more than 10 years, the Skyline Sno-Riders say they won’t let the situation prevent them from holding a fundraiser next year. For 26 years, the UTMA has held an annual ride down the very popular 10-Mile Wash. UTMA is a great club with lots of volunteer projects and charity events to their credit. Sadly, the 10-Mile Wash Ride is no longer a UTMA event because BLM’s permit process simply made it too expensive. The choice was either to operate the ride as a true commercial venture or spend the UTMA’s entire yearly budget on permit and insurance fees. The Hurricane ATV Jamboree applied for a 5-Year Special Recreation Permit on BLM land for a small ATV Jamboree in Southern Utah. The BLM is planning to charge the Jamboree for necessary environmental analysis, but tells them that the cost will depend on the response of a radical anti-access group, the Southern Utah Wilderness Alliance. BLM claims challenge by this extreme group would nearly double the cost of the permit. 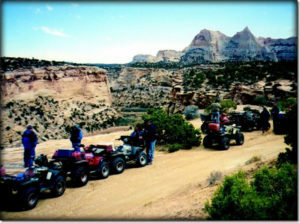 The New Mexico 4-Wheelers was sent a letter from Utah BLM, Monticello Field Office threatening to impose “penalties or fines” for violation of SRP regulations for a May 2004 trip on the popular and scenic Hotel Rock Trail. 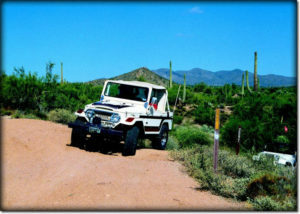 The New Mexico 4-Wheeler’s event consisted of 2 vehicles. The New Mexico 4-Wheelers had put a notice of the ride on their website, thus triggering the same permit requirements imposed on a real for-profit commercial enterprise. I have noted that website nm4w.org advertises organized trips on public lands within the Monticello Field Office area. Last October, Chuck Peeples was listed as a point of contact for an event for Hole in the Rock and you were listed for the event held May 6-9 on the Hotel Rock Trail. At this time, New Mexico 4-Wheelers do not hold a Special Recreation Permit (SRP) with the Bureau of Land Management (BLM), Monticello Field Office. An SRP is required for all commercial and/or organized events to be held on public lands (43CFR 2930). Failure to comply with permitting requirements could subject you and your organization to penalties and fines. If you would like more information on applying for an SRP or have any further questions, please feel free to call me. The Utah BLM, Moab Office is attempted to charge the Bookcliff Rattlers $1900.00 per mile for a one-year permit for a motorcycle race. BLM is charging for monitoring and route delineation. These are required duties of BLM not associated with SRPs. The cost of $1900.00 per mile is interesting compared to the cost of purchasing a valid right of way on adjacent Utah State Trust Lands. Purchasing an easement is less expensive than BLM’s permit costs! The Idaho City 100 is an American Motorcyclist Association National Championship Reliability Enduro,and 2011 will mark the 27th annual Idaho City 100. This event is fairly unique today, and draws riders from all across the country, as this is one of a few events in the U.S. that will be used to select the American team for the International Six Days Enduro, the most prestigious international off-road motorcycle event and is considered to be “The Olympics” for this segment of the motorcycle community. The event itself is a two day event with 300 riders per day traversing about 120 miles of course using a combination of USFS lands, Idaho Department of Lands property and private lands owned by Potlatch Industries, a timber company. On February 28, 2011, representatives of the Boise Ridge Riders (BRR) met with Acting Idaho City District Ranger Lori Wood and three other Boise NF staff members to discuss the permit for the 2011, 2012, and 2013 IC100 events. Pursuant to previous conversations with the agency, BRR representatives reported that the required analysis could be completed by qualified environmental analysis firms for well under $10,000. This was quickly shot down by the FS staff, and they told them that the level of analysis they wanted to see would be over $50,000 and could exceed $100,000. Additionally, BRR would have to pay “cost recovery” fees for the FS staff time to supervise the contractor, prepare the permit, and monitor the event, and that this would likely exceed $10,000. On top of this, the club would be required to hire an approved archaeologist to survey every foot of every trail they wanted to use, at a cost of roughly $1,000 per mile. As noted, this year will be the 27th annual IC100, with no recorded instances of significant problems with the event and BRR management of the event. Prior to the February 28 meeting the USFS has considered it such a low impact event, they have used a Categorically Exempt (CE) level of analysis to support issuance of a Special Use Permit for over 20 years and is preparing another CE to authorize the 2011 IC 100. It must be noted that the Idaho City area is somewhat unique in that it is a highly industrialized and modified forest. The area was heavily mined starting in the 1800’s, and then heavily logged for decades. Moreover, as part of the national USFS directive to limit motorized use to designated roads and trails only, the Idaho City Ranger District completed a Travel Management Plan (TMP) in 2009 that formally designated most of the trails developed by BRR over 26 years of permitted event. During the public input phase, as well as during several personal meeting with the District Ranger, they asked that the IC 100 be substantively included in the TMP EA so that the need for further extensive environmental analysis would be eliminated. Sadly, the USFS refused this reasonable request. Consultations with the agency are ongoing and now include staff from Idaho’s US Congressional representatives. It is hoped a reasonable solution can be found. Click button below to send us your SRP horror story. Ocotillo Wells State Vehicular Recreation Area (SVRA) offers more than 85,000 acres of desert riding, open for OHV exploration and recreation, and is operated by the California State Parks OHV Division. Anti-access groups have filed a lawsuit seeking a court order to force CA State Parks to limit off-road vehicle use to designated trails, arguing that the core State Park management policies are illegal and should be changed. This will effectively eliminate Open riding, which has been the traditional use. BRC is serving in a partner/support role with regards to Ocotillo Wells SVRA. BRC focuses primarily on federal land access and related litigation. Regarding state land issues (like California SVRA’s) BRC works with and partners with state or regional OHV groups and such is the case with Ocotillo Wells SVRA. BRC continues to be in contact with the Tierra del Sol 4×4 Club (TDS), Off-Road Business Association (ORBA), and the California Association of 4Wheel Drive Clubs (CA4WDC) on the Ocotillo Wells SVRA as they are the point groups on that particular issue. BRC’s point person on the Ocotillo Wells SVRA issue is BRC board member, John Stewart. John is also affiliated with TDS and is a contractor for CA4WDC. Tierra del Sol 4WDC (TDS) hosts their annual Desert Safari in Ocotillo Wells. They have retained legal counsel in partnership with AMA District 37 and have been working with Ocotillo Wells staff, OHMVR Division Cal State Parks, and Cal Dept of Justice concerning progress of the lawsuit filed by PEER et al. Current status (as of 2/7/14) is the suit has had one judicial review under the “demur” process where State Parks asked the judge to dismiss the suit or the plaintiff to show cause to continue. The judge did accept the State Parks argument that it was premature to continue with the lawsuit as the complaint was filed. The judge did provide PEER et al with a 20 day period to amend their complaint. PEER did file an amended complaint which is expected to be reviewed by the judge within the next 30-60 days. That review will either dismiss the law suit or place it on the court docket for further legal review. 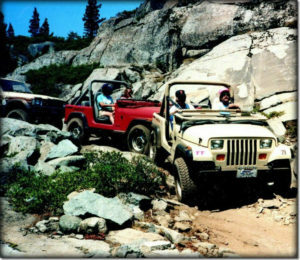 Californis Association of 4WD Clubs Inc. Right now, a lot of BRC’s resources are focused on the Sage Grouse which has the potential to impact OHV casual use and permitted events in 11 western states including CA and NV. BRC will engage in the Ocotillo Wells issue as requested by our partner groups, TDS, ORBA, and CA4WDC. 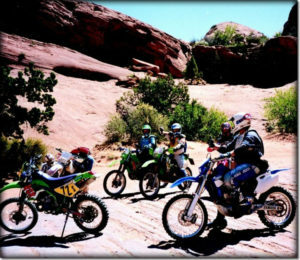 Sand Mountain, near rapidly-growing St. George, Utah, is a popular off-road recreation area. The area is primarily on Bureau of the Land Management land and encompasses 21,000 acres designated as a Special Recreational Management Area (SRMA) and is an open riding area. The Sand Mountain SRMA is a popular spot for riders throughout the region and draws participants during the Winter 4×4 Jamboree and the Tri-State ATV Jamboree, among other organized events, from many states; however, its future is in jeopardy. A proposed land exchange would trade 1200 acres of this open riding area to a private developer and potentially encourage further exchanges and/or restrictions to future recreational activities. The OHV community has lost most of its open riding areas on BLM lands and has compromised away numerous roads and trails in an effort to reach long-term stability and certainty. BRC believes this is a prime example where past compromises and promises have not provided certainty or security. A local group– the Utah Public Lands Alliance (UPLA)–has been organized to oppose and defeat the proposed exchange. Visit their website utahpla.com for more details and updates on the proposed land swap. Follow this issue with us! Your help may be needed to keep Sand Mountain intact. We will ask for your support as time becomes critical. TThe U.S. 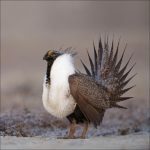 Fish and Wildlife Service (FWS), has announced that they are reopening the public comment period on the October 28, 2013, proposed rule to list the Bi-State distinct population segment (DPS) of greater sage-grouse (Centrocercus urophasianus) as threatened under the Endangered Species Act (ESA). BRC’s members in Nevada and California remain concerned about the lack of “trail-based OHV recreation” representation in your process. After reviewing the documents for today including the most current staff reports, I continue to share that concern as well. The Bureau of Land Management and Routt National Forest released the Draft Northwest Colorado Greater Sage-Grouse Resource Management Plan Amendment and Draft Environmental Impact Statement for a 90-day public comment period. 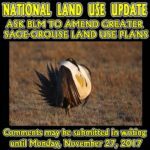 BRC’s “Sage Grouse” headquarters wants to give OHVers in Nevada an update on what we are doing related to the Sage Grouse and any potential impacts it might have on motorized recreation. 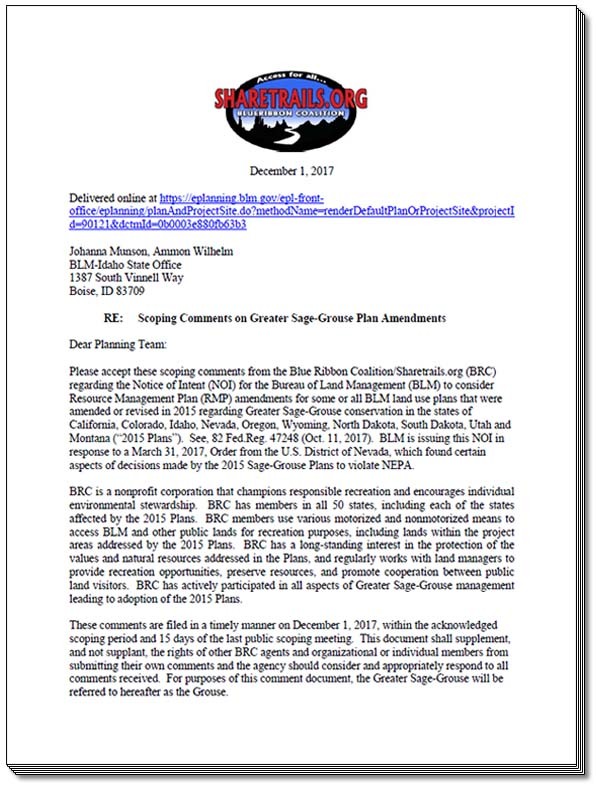 On January 28, 2013, BRC submitted comments regarding the Humboldt-Toiyabe National Forest’s Scoping Notice for the Greater Sage-Grouse Bi-State Distinct Population Segment Forest Plan Amendment Environmental Impact Statement (EIS). What sets the sage grouse issue apart from other Endangered Species is the size of the habitat. To this day, nobody knows how many acres of public, state and private lands will be designated as “critical habitat” but the figure is staggering. Millions upon millions of sagebrush grassland habitat could be affected. CLICK HERE for the BLM’s map. This information comes from a number of different sources throughout the US and is a great source of information on the economic impact of Off Highway Vehicles and motorized recreation has on the economy.